Flooring is one of the most important elements of a structure. However, that is not enough, you may be specific about their look and feel too. If you are very particular about the aesthetics of the place, you should consider inlays, which are designed to accentuate the beauty of the flooring. These are decorated flooring patterns that are cut out of the flooring material. These patterns are created using various methods. However, today manufacturers are largely using waterjet cutting to produce attractive flooring inlays. Why? Read the post below to know the answers. Why is Waterjet Cutting an Ideal Method for Creating Floor Inlays? Cutout Accuracy: Waterjet machines provide high cutting accuracy. Hence, it is perfect for creating inlays that require high precision, as well as tolerance. Design Flexibility: Waterjet machines produce a sharp water stream, which can cut through any type of material, and allow design flexibility. Hence, flooring inlays can be created in any desired shape. Designers can also create intricate detailing on these inlays. Minimal Cutting Defects: Waterjet cutting receives its name from a water stream that is used to cut surfaces. Thus, it is a cold cutting process, which produces no heat. This minimizes the chances of surface deformation due to heat distortion. Superior Edges: Water jet cutting is the only method that can ensure burr-free edges, which is why it is becoming a choice for creating tile inlays. Most times the inlay patterns require no secondary finishing. There is an abundance of variety when it comes to creating waterjet flooring inlays. Here, we have attempted to differentiate these inlays on the basis of flooring materials, as well as flooring patterns. Porcelain Tiles: These tiles are made from ceramic, and used to cover walls or floors. Rubber Floor Tiles: These tiles are ideal for high traffic environment. Laminated Floors: Generally, hardwood flooring is laminated to protect from scratches, dulling, stains, etc. Linoleum Tiles: These are the types of eco-friendly flooring created using wood flour, as well as eco-friendly materials. These tiles can be availed in different styles, as well as colors. 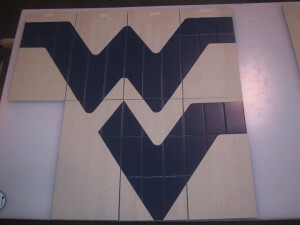 Vinyl Composition Tiles: These tiles are scratch resistant, water resistant, and built for high traffic areas. These tiles require no maintenance, and are becoming a choice for homeowners. Various expensive inlay patterns can be experimented over the vinyl composite tiles using waterjet machine. This allows users to enjoy the benefits of expensive patterns of hardwood, oak, and ceramic tiles at low costs. Slate Tiles: These tiles are perfect for any room in the home, and can improve aesthetics of any place. Fritz Tiles: These tile inlays are perfect for high-traffic areas, where longevity, appearance, and low-maintenance becomes essential requirements. 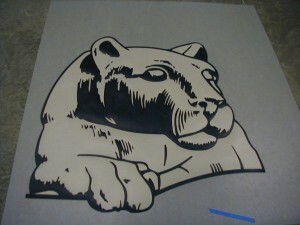 Custom logos or designs can be created over fritz tiles using waterjet machines. Carpets: These flooring materials have been around for a long time. Earlier people were only aware of plain bright carpets. Thanks to waterjet cutting, today colorful designer carpets with various designs are getting popular. Medallions: The medallions are large circular accent pieces that are cut from the material such as natural stone, slate, granite, porcelain, limestone, etc. Waterjet cutting is a suitable method for creating inlays because they help materials retain their original properties. Stone medallions and wooden medallions are two of the most popular waterjet inlays used around the world. Waterjet stone medallions are created by cutting large stone slabs by tightly assembling on a backer. Stones are polished and sealed to ensure there are no gaps between pieces. These stones are cut to tight tolerances using a waterjet machine. Also, stone medallions require less maintenance and are engineered to fit into hardwood or stone floors. Herringbone: This pattern features parallelogram or rectangular shaped wooden inlays arranged in zigzag patterns to resemble bones of herring fish. French Herringbone, also known as Chevron Herringbone refers to rectangular wooden boards that are cut at 45-degree angles. Double herringbone boards are created in three sizes. Marquetry: These patterns are created by arranging veneer pieces in particular designs to create decorative flooring. Custom marquetry inlays are used over wall panels, cabinetry, door ornaments, etc. The marquetry pieces are custom created, and can be lacquered or sealed or offered unfinished. Floor Borders: Waterjet cutting is used to create customized patterns. The pre-assembled patterns can be glued to any clean, dry, and sub-floor. Accent Floor Tiles: These floor types are used to accentuate tile arrangements in bathrooms, kitchens, or other recreational areas. Decorative patterns are created over the floor tiles using a waterjet cutter. Apart from the above-mentioned inlay types, you can experiment different types of decorative and designer flooring by employing water jet cutting. By now you might have realized that sky is the limit of imagination when it comes to creating inlays from waterjet cutting. You don’t need to bother about the material, heat, or temperature restrictions when working with waterjet cutters because they use sharp water stream to cut through surfaces. This entry was posted in flooring inlays by Hydro-Lazer. Bookmark the permalink.